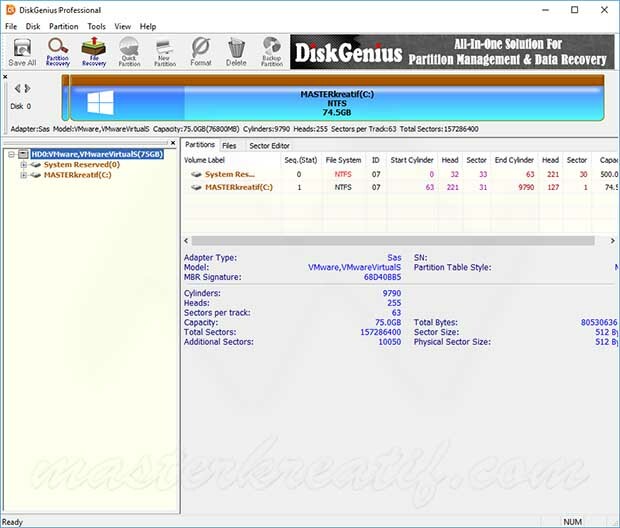 DiskGenius (formerly known as PartitionGuru) is a powerful and all in one solution for home users and IT professionals to recover lost data, manage partition, and more. DiskGenius Full Version helps you restore lost files with any reason, including deleted data, formatted partition, system crashes, disk failures, virus attack, and more. In addition to data recovery, it also offers disk and partition management functions so you can create, delete, reformat, resize partitions, repair disks with ease. DiskGenius Professional provides more powerful functions like recovering lost files, clone partition to image file, partition and disk clone, quick partition, backup and restore image file, recovering lost partitions, and other advanced operations. It fully supports virtual and physical environment including VMware, VirtualBox, and virtual disk files. Supports FAT12 / FAT16 / FAT32 / NTFS / EXT3 of SCSI, IDE, SATA drives, USB drives, and other storage media.